I just saw "Avatar" with three other veteran science fiction fans--two middle aged couples. Someone had described it as a film you have to have seen in order to be able to talk with anyone under 40. I suppose that's so, unless you have the sort of prosaic mind that can only relate to movies about people who look and act like you in places much like what we see around us. I'm not sure it's a great movie. But it is great fun, as long as you don't think too much. And a bit moving, as long as you don't feel too much. And it redefines what you can put on a screen (if you've got his $300M budget)! To me the most important aspect is facial animation. One of our group was underwhelmed by it--by how they'd been able to instrument the live actors' faces and transmit their expressions to the animated characters you see onscreen. Our friend had heard such glowing reports of it that perhaps he expected too much. He said he'd seen better facial expression animation in other films. But the rest of us thought it worked well and looked great. Perhaps it's that none of the actors were showing a lot of nuance--whether that's the acting, or the direction, or the limits of facial expression animation today, I don't know. But the animated characters definitely looked like the live actors. In some ways it's like a cross between a traditional fantasy movie and a traditional science fiction movie, with a hint of sci-fi explanations for the sorts of things that are norma lly explained magically. The forest scenes on the alien planet reminded me of the forest scenes in Hayao Miyazaki's great (non-computer) animated film "Princess Mononoke." If you haven't seen this film, I'd strongly recommend seeing it after you see Avatar. The military scenes reminded me--less so--of "Starship Troopers." That, too, would be interesting to see after "Avatar." I'm an educated layman when it comes to military technology, biology, exobiology, cinema, and Cameron's films--I've seen "Abyss," "Aliens," "T1," "T2" & "Titanic." And enjoyed them all. I know what to expect from Cameron. Unfortunately, I know enough about those subjects to know when Cameron was going for an onscreen effect and defying logic and what we know about those subjects. I'm also a veteran scuba diver, and I saw where he borrowed from underwater scenes I'm familiar with. Only sometimes the transplant needed anti-rejection drugs so I'd stop thinking about how he was borrowing cool images without thinking through what kind of sense they might be making. Still, Cameron's better than George Lucas and many others in terms of borrowing images more than real ideas. Yeah, I know I'm a voice in the wilderness on this subject. My biggest complaint is the same one I have about most Hollywood sci-fi--more fi than sci, and not always understanding that a whisper can sometimes be more powerful than a shout. Cameron puts all the money onscreen. And speaking of screens--we saw it in a big Imax theater, on the far side, about halfway back. This was because we got there half an hour before showtime. Mistake. It wasn't awful to see it to the side like that, but it was definitely suboptimal. You'd see this best in an Imax theater from the back row as near to the center as you can get. Everyone in the audience who wasn't near that spot got less for their money. The 3D was very, very good. This was, as I recall, "RealD" or some such. It used inexpensive 3D glasses with what looked like mylar lenses. I had some annoying reflections from the bottoms of the big lenses, though they didn't directly interfere with the screen image. Later I want to see it once more in 3D on a non-Imax screen. Again, not necessarily because it's better than lots of other films with more intelligent screenplays, more nuanced acting, etc. ; but because I want to see this cutting edge cinematic technology at work on a wide screen in 3D--and with me sitting in the exact middle and pretty far back. So did the animation look real, or did it still look like animation--especially in the scenese that combined animation with live action? Close. Not quite. Not yet. But we're getting close. You can read dozens of reviews of Avatar that tell a lot more about the story and whatnot than I did here. Avoid em until you've seen it. You'll enjoy this film more if its surprises actually surprise you. I just saw "Avatar" for the second time, under very different circumstances--nearly empty theater, on a conventional big screen instead of IMAX, using the Real3D system and glasses. The theater being nearly empty, we got to sit it the right place this time. Huge difference being able to sit smack in the middle of the theater. But also--I think I liked it better on a conventional wide screen than on IMAX. I can't say this for sure, since our seating was so crappy for the IMAX showing. We've seen other IMAX films, and always found that we only enjoyed the viewing if we were sitting in the back row in the middle, or nearby. This is a hard one to universalize, though. You may prefer the IMAX version. I will say they make for a distinctly different viewing experience, so you shouldn't just flip a coin. You'll probably prefer one over the other. Think it through. I told her that this isn't always bad, though. Some films are more like rituals, where unpredictability isn't what people are looking for. This is one of those films. So don't let smartypants friends dissuade you from seeing it because they have objections to the screenplay. They're probably right, but if they weren't noticing what they were seeing in order to criticize the uncreative narrative--then they've got a real problem. Some people regard works of art for what's missing. Someone wants said music lovers listen to music, while audiophiles listen to problems in microphone placement. "Avatar" has strengths and weaknesses. Most of the complaints about its weaknesses are probably true, but the strengths are so off-the-hook strong that they make it not just worthwhile but necessary to see the film, and see it in a theater, in 3D. Speaking of which we saw it this time with the Real3D glasses. I wear eyeglasses, and these fit over them comfortably. I was happy with the 3D experience they provided. What follows are some further comments that you should probably wait to read until you've seen the film, though it doesn't have plot spoilers. Unless Bill Gates whips out his checkbook, a $300M film must be a blockbuster to make a profit for all involved. That's impossible for a film that just shows domestically. It has to be a world blockbuster. It has to be PG-13 for all those conservative countries, and it has to have an easy to follow good guys/bad guys plot for all those lower middle class moviegoers in Lahore and Belo Horizonte and, and, and. 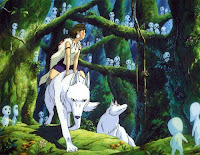 Of course Princess Mononoke was vastly deeper. It could make a profit on domestic Japanese sales alone. Ditto various Japanese anime series. Ditto, for example, the scariest, most morally complex vampire film ever, the Swedish shocker "Let the right one in." Which had virtually no special effects and no name stars...and which, I'm sure, could make a profit from domestic Swedish sales alone. And ditto another film you could compare Avatar with, the Finnish/Russian collaboration "Cuckoo." 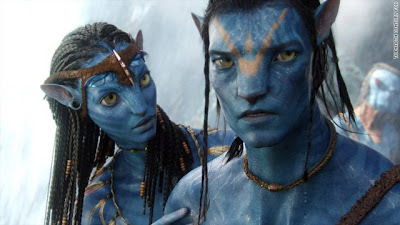 OTOH making the Na'vi look/act so much like us might have shown a lack of imagination or simply needing to make the film fly in the world market, but it made sense biologically. Actually I objected (on scientific grounds) to the Na'vi being as different from us as they were: erect bipedal hominids aren't going to have tails. Nor blue skin. And the huge yellow eyes--you'd see that in a nocturnal animal, while the Na'vi were diurnal. The hairy USB port thing was magic with a sci-fi gloss. I say this because sci-fi fans generally suffer from what I call the "Star Wars Cantina Syndrome." They assume aliens will look/act alien unless proven otherwise, as in Arthur C. Clarke's Rendezvous with Rama, where everything to do with the aliens was at all times inexplicable. But science has a great rule of thumb principle called the Assumption of Mediocrity: we assume what we see and know is par for the course unless proven otherwise. Moreover, you can see the convergent evolutionary forces throughout nature--and I've seen nature at its wildest, most diverse and fanciful, because I'm a veteran scuba diver who has dived from Indonesia to Canada to the Caribbean. It all seems like a hurricane of life forms at first, but later you discover there's a reason for everything. And erect bipedal hominid is the ticket for a dominant tool using terrestrial lifeform. The hexapedal animals, pollen sucking horse equivalents and other stuff was a lot less likely. Didn't interfere with repaying that $300M investment, but it lessened my own buy-in. One of most powerful evolutionary forces we've seen is the one forcing down the leg count on terrestrial animals above the scale of one with an exoskeleton. If you want to see a fairly recent sci-fi film with an actually interesting plot/characterizations/moral complexity, see "Serenity." There's no use to watching Avatar and thinking about how it should have been adapted to the viewing desires of an educated minority. As others have said, just wait for the technology Cameron pioneered to become available at a lower cost. Then it will get very exciting. But for now and forever, the most cutting edge huge-budget films will always be lowest common denominator crowd pleasers. Except, of course, for "2001." I'm still amazed Kubrick was able to get that financed.